Just past the Pelikans lies my Laban Kaiser. It’s a big handful, but the resin is actually surprisingly light. It’s not actual ivory, though it resembles ivory closely. 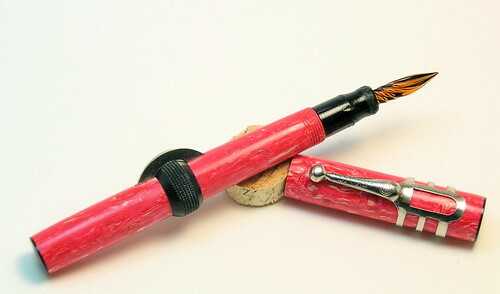 Deb Kinney wrought a stunning fine stub of the nib, so it’s a super writer with fine line variation. I don’t have any other Laban pens, but this one pleases me greatly. Over yonder is a Rotring Rapidograph. It‘s not my first fountain-type pen (a rapidograph I bought during my summer language course in France), but it’s nearly the same model. I wrote with that all through my last years of high school, learning to write Greek letters, doodling, taking notes, and generally relishing the experience of making lines that weren’t just plain oily ball-point ink, but gloriously varied shades of inks I could buy at the Pitt Book Store in the art supplies section. I know my first rapidograph made it to college with me; if I recall correctly, the cap cracked in some moment of collegiate carelessness. That’s the Spors crescent-filling glass nib pen that I wrote about as I was trying to pull the section in order to repair the sac. I got impatient, and marred the section — but it’s a very interesting writer, and I still marvel at the plastic. I thought those colours were illegal until the 60’s! Another example of vivid colour comes from this pen-and-pencil set that I picked up for a pittance. 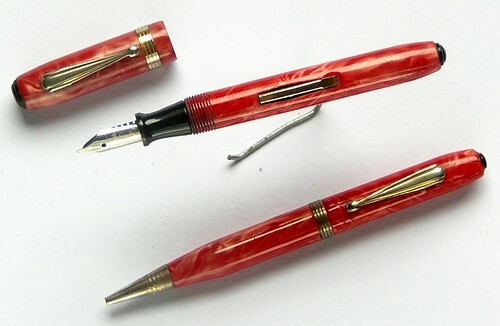 They’re made by Welsharp, are rather small (I’d say between 7 and 9 cm), and sport a swirly red-gold pattern. Ross repaired the cracked pencil cap and gave the pen a once-over; they should work (I have’t tried them, to be honest), but they’re way too small for my hands to work comfortably with them. If I test them successfully, they probably have ‘sale’ or ‘gift’ in their future. Here are two I blogged about earlier — a gift from spectacular former student Suzie Stark — and now back from servicing and fully functional. 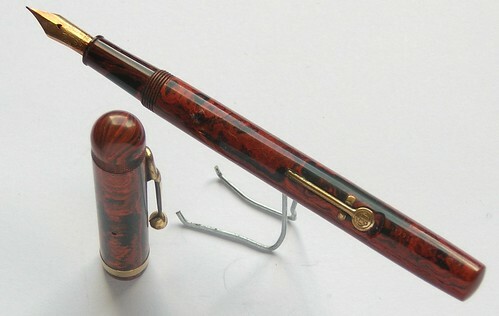 One is a Waterman pen with a fat, wet, flexy stub nib and exquisite marbled barrel. 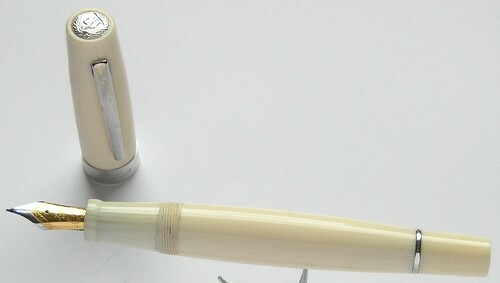 The other is a Conway Stewart pen made for Lyons of Glasgow. It arrived with a chip out of the threads on the barrel, which made restoration of the original pen practically impossible; Henry Simpole of London consulted with me, and he happened to have a nearly-identical barrel i his parts supply. He replaced the chipped barrel with his intact barrel, polished and replaced various parts, and returned the pen to me as good as new. Speaking of Watermans, here’s a Waterman Kultur, again with a modded fine stub nib, and again shoing its status as a reliable writer. 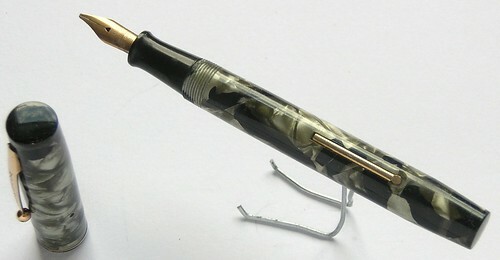 I have a black Waterman Phileas at the office; I’ll add that to this post when I bring it home and shoot it. 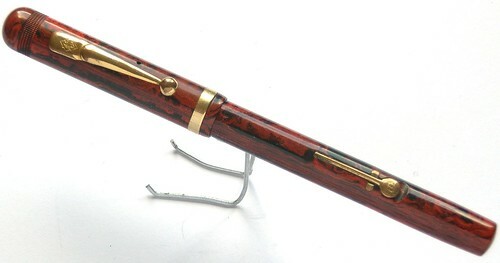 There’s also a snazzy pen, a present from Margaret, with olive wood barrel and cap and metal furniture. They’ll both come here in the post when they come home. Toward the end of the Alcove of Alterity are my Eversharp Skyline pens. 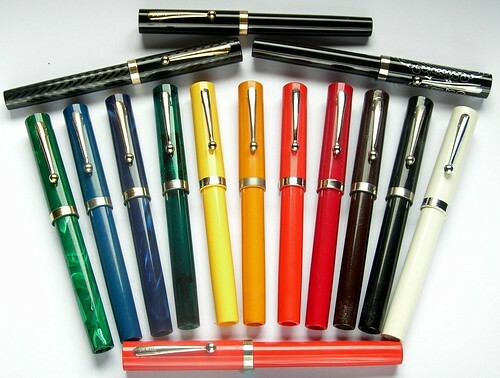 The Skyline is a gorgeous pen with jet age design values. Look at the snappy hollow bowler-cap clip! The plastic isn’t quite as stable as one would like — one of mine is a bit wobbly in shape — and I haven’t gotten either of the pens I picked up for myself working very well. The Skyline Presentation model, with the gold cap, was a present from Bishop Smith of Missouri, for whom I led a clergy conference years ago; I’ve not had any trouble with that one (presumably his episcopal sanctity and his restoration skills combine to ensure smoothly-operating pens). That brings us to the end of the alcove, which opens on the Sheaffer Hall. At the gate to the Sheaffer Great Hall, though, is the display of No-Nonsense pens, numerous of which came to me as a very generous contribution from Bowdoin classmate Greg Lyons. At the time, I promised Greg I’d post a photo of the ensemble; here it arrives late, but the included pens are the more numerous for the delay. More about No-Nonsense pens next time, when we step past the Alcove into the Great Hall itself.